The debates around diagnosis and medication are fraught and passionate. They easily become polarised, especially on reductive platforms like Twitter, and positions can quickly become entrenched. It’s because the debates matter: they are about us and the people we love, they are about how we support one another, and what kind of world we want to live in. They are also about expertise and power: who has the right to talk and whose views matter more. But my fear is that in the anger and passion, in the quest for truth and wins, we are perhaps forgetting people. The recent online scuffles around pill shaming and diagnosis have highlighted for me the widening gulf between theory and practice in the debate around diagnosis, and how individual meaning making may be lost in the search for ideological purity. When I see the anger, the in-fighting and people turning on each other in the gladiatorial pit of Twitter, I think – who is winning here? The truth – and if so, at what cost? I find, and I am pained to say this, that there are at times more similarities than differences between those who believe vehemently in the biomedical model, and those who argue passionately against it. Most people don’t live in either of these camps, and have nuanced views about the validity of different diagnoses, or on the different impact they can have on our lives. Most of us are familiar with the entrenched arguments of those who argue that mental health difficulties are psychiatric illnesses which require in the first, and sometimes only, instance a medical response. But for me, in a way more insidious and just as powerful, is the subtle judgment emanating from some people who strongly disagree with the biomedical model. There can be an evangelical fervour about those who argue that distress is not a symptom of a mental illness, but a natural response to trauma and adversity – and that medication therefore cannot be the answer to a problem which does not in fact exist. At conferences, in groups, on forums, I’ve seen people who identify as ill being shut down, or, perhaps worse, subtly patronised. There can be a sense that on this supposed journey we’re all on, understanding yourself as mentally ill is an intermediate step towards a more enlightened state of being – and that one day we’ll all understand that our distress is in fact a meaningful response to what has happened to us. Is it possible to say that that the biomedical view is ‘a lie’, without saying that the people who believe in it have been tricked or believe lies? Often, the question is fudged, with the vast majority of people saying they respect the choice of individuals to define themselves as ill if they choose. But it can be, in my view, a fudge, a sleight of hand – and the fudge is what people are responding to when they say they feel invalidated. Moreover, there is, for me, something deeply uncomfortable in witnessing a small group of people with power debating someone’s experiences with another small group of people with power – and telling them that what they’ve believed until now is in fact a lie. This is very difficult to write, but it feels invalidating to me – in fact, it feels almost oppressive. Most of those who argue passionately against diagnosis have themselves experienced trauma and adversity. They have felt silenced. They believe that they are fighting for all those who have been oppressed in similar ways. And yet for me, as soon as we start to talk in absolutes and speak for others, we risk silencing people. I believe that, in this polarised debate, both sides can be equally guilty of not respecting or not seeking to represent all the views out there. It can sometimes feel like we are so concerned with talking about the System, or the Evidence Base, or Big Pharma, or Discourses, that we talk in absolutes, and forget the nuance. For example, it’s quite clear to me that we can’t talk about pills being bad or good for everyone. I think some people can find medication life-saving, others life-ending, many more something in between. It depends on the meds. Talking about anti-depressants is different to talking about anti-psychotics. Talking about a depot is different to talking about a Prozac script from a GP. For some, it’s literally life or death, salvation or abuse. For others, meds worked for a while, and then stopped working. For yet others, meds are forced upon them in a violation of their human rights. It’s complicated and fraught. For me, it feels unacceptable to write about psychiatric medication without referring to the deep suffering and anguish it has caused many – in the experience in itself, in the side effects, in the withdrawal and in the iatrogenic trauma. It is equally unacceptable in my view to write about diagnosis without honouring the myriad survivor stories there are out there of people feeling shamed, stigmatised, hopeless and stuck because of their diagnosis, and of people who describe the harm, distress and abuse they have suffered as a direct consequence of the medical model. But for me, it’s equally unacceptable to write about meds without acknowledging that for so many, they have proved to be helpful and lifesaving; that, weighing up the pros and cons, many decide to stay on them. Some people find diagnosis a necessary evil, a gateway to the support that they need. Many people find it validating, as it gives a name to the suffering and path towards recovery. Diagnosis and medication, like any issue in mental health, take place in an emotional and political space. If you are accessing services or need a diagnosis to be eligible for benefits, diagnosis is not an interesting debate: it’s about survival. Equally, there are also those who have found that it’s only by challenging their diagnosis and politicising their madness that they have found a way to survive. The political context of diagnosis is that most people simply do not have a choice. The biomedical model is the dominant one, and the only one which many of us will come across when seeking help. Additionally, very few of us will be prescribed medication with full informed consent. The many side effects of medication, some of them life-altering, the addictive nature of some and the difficulties we may have in withdrawing from them; the lack of evidence around the efficacy of many drugs, the deep and complex ties between pharmaceutical companies and the medical profession which skewer objectivity- these are not issues most lay people are aware of. However, anyone who is writing about the mental health world will know that these are live, contentious issues, and not referring to them, even if we disagree with them, can only paint a partial picture of medication. Therefore the debate is often unfortunately framed in binary terms (for or against the medical model) and both sides can be guilty of ignoring the evidence and testimonies which do not buttress their arguments. But for me, the challenge is actually deeper. As a direct consequence of the debate being framed in binary terms, we’re witnessing the emergence of the alternative single story. In the same way that the biomedical story has been the single story around mental health, so it can seem to many that the trauma model is attempting to usurp this position. Once we opt for a single story around mental health, whether that’s the story of illness, or the story of trauma, then we by definition exclude others. Arguing that all distress stems from trauma and adversity might not speak to those who experience their distress as spiritual renewal; those who see it as neurodiversity, as part of who they are and how they are in the world; those who understand it as a psychosocial disability; and of course those who see madness as an illness, a sickness of the brain. Many of us will probably see themselves in some or all of these stories, a patchwork of identities. Some of us won’t make sense of our distress. That’s OK too. There are in fact as many stories as there are people. The single story, whether that of illness or that of trauma, doesn’t honour this multiplicity and this complexity. However, my main concern is how we’re framing the debate around diagnosis in scientific terms. I deeply respect all of those who have put forward cogent and compelling arguments as to the scientific invalidity of diagnosis. But I’m worried that the logical consequence of this might be that we find ourselves only advancing alternative models to understanding distress and madness which are evidence based. But if we argue that we can only understand distress through a scientific model, albeit a more rigorous one than diagnosis, what does this mean for those who don’t make sense of their experiences in this way? What happens to those who find spiritual meaning in madness? How can we hear and hold the stories of those who have radically different beliefs to ours, which defy current scientific thinking? I worry that stories about aliens, conspiracies and persecution might get re-worded and reframed, just like they have been by psychiatry. The issue for me is not which story is true – because in a way they can all be true for us individually, and none of them are true for everyone. It feels urgent and important for me to rethink how we argue about diagnosis, to be aware of the consequences of framing the conversation in scientific terms, to explore what we mean by truth and to reflect on how epistemic injustice can be perpetuated. But these arguments do not (just) take place in lecture theatres. They are about people’s lives. What really matters to me is practice. On a practical level, it feels like so many are pushing for deep reform along specific lines, where, for example, we drop the language of disorder entirely. I don’t disagree that mental health services in the UK need deep reform, but I’m also interested in what is possible. On a personal level, there are few things I like more than the beauty of a clean and elegant argument. But I’m suggesting that it’s entirely plausible to imagine an imperfect system which is utterly theoretically illogical and yet which offers choice: which offers medication, and trauma informed therapy, and CBT and mindfulness, and peer support and social prescribing. A system where the language of illness might sit side by side with the language of trauma, where we talk about the biological causes of mental illness as well as the social causes of distress. It’s utterly illogical and it’s probably deeply undesirable for both biomedical and trauma purists. But, here’s the thing. I think we’re very good at creating muddled and illogical systems. Why not this one? For me, this is about challenging the hegemony of the biomedical model rather than its truth. Let’s try and chip away at the power of the diagnostic model- position it as one story amongst many – rather than try and see it swept away in a trauma informed revolution. Let’s move the argument away from lecture halls, conferences and Twitter – and into people’s lives. 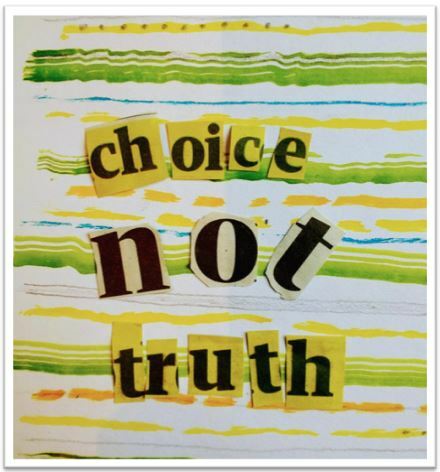 Let’s fight for choice, not truth. This is a PREVIEW ARTICLE from the forthcoming issue of Asylum. Subscribe to Asylum, to read Asylum 25.3 in full. Plurality of beliefs and choice over any issue are fundamental to liberal, civil society. Committed to those values, I find myself in agreement with most of what you say in your piece, Akiko. I just have a few comments to make: where you say you welcome a necessary illogicality, I would substitute the word ‘incoherence.’ ‘Illogical’ implies a bottom line of irrefutable logic. We all live storied lives, with internal contradictions among the narratives that make up our messy incoherent lives. The joy is in the non-existent narrative bottom line. There is however, I believe, a contested moral order to stories. Some are argued as better quality than others, and this will ever be the case. I see critical standpoint positions inevitable and necessary in this context. These sometimes, unfortunately, segue into the attacks, and personal and group hurt, you describe. In the battle for epistemic and moral authority about the nature of human misery, I think this is sadly inevitable. I find myself currently in the relatively incoherent position of agreeing that humanity needs to be free to understand it’s misery in myriad ways, while also, in the interests of building hermeneutic and testimonial – justice, needing to be much more aware of, and able to articulate, the power stakeholders at play in its causes and – contested – solutions. I see the key problem as the coercive backing of the state. The analogy with the church is strong I think. The American founding fathers did not take their huge step to ending centuries of religion inspired carnage with tougher rules and penalties but by making all religions free and equal while severing the nexus of any one to the state. It is very easy to write this type of article when polarisation arises in a domain of discourse. It doesn’t say anything that hasn’t been said before in other arenas; politics, religion, etc. It is very easy to write this kind of article whenever polarisation arises within a domain of discourse. It isn’t original and adds nothing useful. Thank you for writing this. After over 40 years working in the mental health field from Soteria House ( original in San Jose California) to chief of adult services in the county public system to Now program chief for the foundation for excellence in mental health care I have arrived at the same conclusion for these debates. What I find though is people still think I’m anti meds even when I clearly state that “ I’m not”. I hope the work we are doing at the Foundation for Excellence in Mental Health Care is being understood to embrace whatever works. Choice vs one path for all. The uniqueness of each individual must be fully embraced. At last! Thanks Akiko for expressing my long held view about the unhelpfulness of the polarised debate. Life and mental health is unfortunately not so simple as either..or. For people who are sometimes struggling with and sometimes overcoming similar challenges to be at war with each other is a sad waste of resources and energy. For people trying to support them to be involved in the same conflict is almost comedic were it not so nasty . I have met some humane and humble psychiatrists taking risks and caring passionately about their patients. And I have met some very bad ones. I have met some people doing well without meds. And heard of others who have not survived as a result of coming off them. I rest my case. Is there a problem in choosing choice as a model? Would you force someone to be of choice, or would they choose it of their own free will? I like to think I present arguments, but then try to value what others do with them. I am open-minded, but not so much that my brains fall out. Thanks for the very thought provoking article, Akiko! Yeh well for some of us who have been abused by the drug pushing psychiatric profession for years and had our already fucked up lives ruined even further, this is simply a human rights issue. When shrinks use CTOS and sections to force treatment on those they wish to socially control they are simply The Thought Police who carry the weapon of diagnosis. No person should be locked up without a solicitor present. Yet this imprisonment without representation happens routinely. You don’t get out unless you comply with the bastards. It doesn’t matter what does or doesn’t cause mental illness or problems or whatever you want to call it. We can’t work that out because we don’t know what the mind is yet and we still know very little about the brain. THe medical model is flawed. If you defend it you defend the status quo. Sitting on the fence never achieves anything. THe trauma model, the spiritual model , the hurdi gurdi hocis poxus model or whatever, the cool and different just like everygody else model, whatever, the hyper intelligent sensitive can’t hope bang bang, all models might or might be valid or not valid. THe point is if you want anything to change you simply have to challenge the status quo and that is the INSTITUTE OF PSYCHIATRY stuck up pretentious twats who think they know it all and yet it is the sufferers of mental distress, illness, fugue or agghhhh syndrome that know what they are talking about.